Even the name has a magical ring, and magnolia trees are among the most beautiful trees in the garden. Sometimes they can be confusing, because there are two distinct groups. So when a magnolia is pointed out to you, it may not match what you have seen before. In warmer parts of the country, and especially in the south, you will see the Southern Magnolia, with its large, glossy, evergreen leaves. Look beneath them and you will see a dense, chocolate-brown fuzz on the underside, a dead giveaway that instantly identifies this tree, even when not in bloom. The large, creamy-white and intensely fragrant blooms come in early summer, and continue sporadically until fall. Beautiful as the Southern Magnolia is, if you garden in colder parts of the country it is beyond your reach, since it will only grow to the limits of zone 7. You might equally have someone point out to you as a magnolia, in late winter or early spring. It will be a striking bare-branched tree carrying upright or open large blossoms in white, pink or purple. Often the outside of the petals will be much darker than the inside. After blooming, oval, mid-green leaves will develop, which can turn rusty yellow in fall. These will drop and leave the bare architecture of the branches for the winter. This will be one of the many species and varieties of deciduous magnolia. Although much hardier than the Southern Magnolia, these trees mostly only flower reliably into zone 5. If you live in zone 4, these plants are out of reach. But do not despair, because help is at hand. For rock-solid, reliable blooming in the coldest parts of the country, we must to turn to a species of magnolia that is hardy even in icy Canada. It will bloom reliably in zone 4, and even colder areas, in sheltered locations. To find it in its original home, we have to travel to Honshū, the largest island of Japan. We must explore around Ise Bay, where the Kiso, Ibe and Nagara rivers come together before spilling their waters into the Pacific. There, along streams and in boggy areas, we will find a spreading shrub or small tree with a smooth silver-gray bark, and oval leaves. As it matures it forms a broad bush, wider than it is tall, reaching perhaps 10 feet tall and 15 feet wide in its old age. In spring plants will be covered in blooms that are unusual among the magnolias for their open, star-like form. Each flower has at least 12 narrow, strap-like petals, that radiate out from the center, spreading wide as the flowers mature. In the wild they can be pure white, or shades of pink, with the darker color usually on the back of the petals. In the 19th century it was the US that opened Japan to trade, and it was to the US that this plant was first brought. A certain Dr. George Robert Hall introduced it in 1862, some time before it arrived in England and Europe, around 1878. Botanists named it Magnolia stellata, an obvious reference to its unique star-like flower form. It didn’t take long for gardeners to discover that this plant was remarkably hardy. Not only did it begin to bloom when very young, it would be smothered in blooms in cold places where no other magnolia could keep its flower buds alive through the winter. If you crave magnolia blossoms to brighten up your spring, then this is without doubt the number one choice if you live in zone 4. The original species, in its wild form, can still be found, and it makes a beautiful shrub for a damp, lightly-shaded or full-sun part of your garden. As it matures the twisted branches gives it a beautiful winter profile – one of the most beautiful for winter effect. The fat flower-buds, covered in a soft fur, decorate the bare branches with the promise of pleasures to come. The Star Magnolia is beautiful, but it is not at all difficult to grow, which is a blessing. Plant it in full sun in cold areas, and where it has some afternoon shade in hotter places. The soil should have organic material added to it, and make sure it doesn’t become too dry in summer. Although this tree grows in wet areas in its natural home, it will grow well in most ordinary garden soils, if you give a little attention to summer watering. It normally has no pests or diseases of concern. Every spring it will reward you with its unique and beautiful flowers, made even more dramatic by being born on the bare branches, with no distraction from foliage. Because the flower colors of this tree are variable, there are several selections available, that are perhaps superior to the wild form. The most popular and reliable is the variety ‘Royal Star’, with pure white blossoms. It is taller and more upright, growing 10 to 20 feet tall in time, but staying 8 to 15 feet wide. It makes a wonderful background tree, without taking up the horizontal space in the foreground that other Star Magnolia varieties can do as they mature. This tough, easy to grow small tree is the ideal choice for a smaller garden, and really, if you live in zones 4 or 5, it has to be your number one choice for a magnolia. Gardeners are rarely content to leave plants in their natural state, and use them in the high-art of plant breeding. 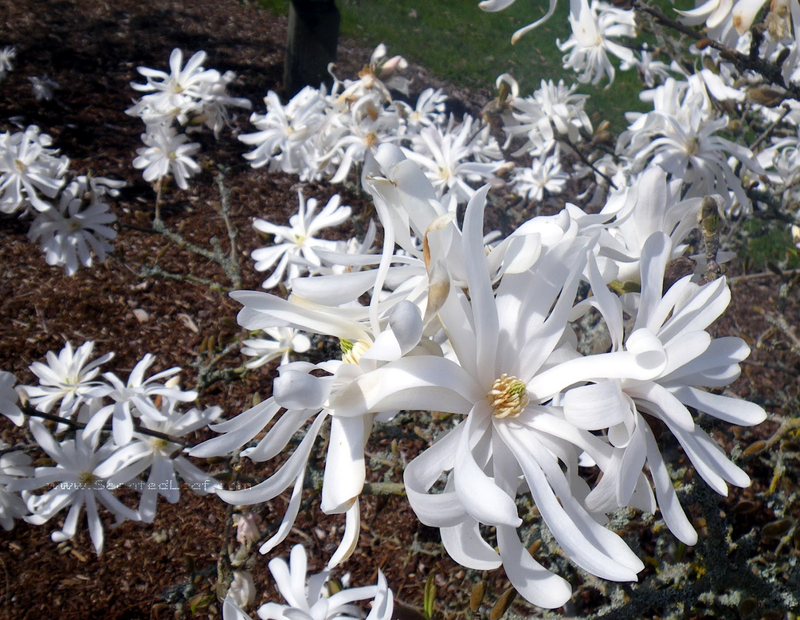 The Star Magnolia was soon used to create interesting hybrids, and some of them are today very popular garden plants. Within 50 years of its arrival in Europe, the Star Magnolia was crossed with another Japanese species, Magnolia kobus, to produce Magnolia × loebneri. This plant is named after its maker, Max Loebner of Pillnitz, Germany. Selected forms of this cross are extremely popular magnolias, particular the varieties ‘Leonard Messel’ and ‘Merrill’. These form taller, more upright trees of great beauty, but they are not quite as hardy as their Star Magnolia parent. They are ideal spring-flowering trees for gardens in Zones 5 to 9, and make a stunning display in spring. Perhaps the most popular and well-known group of these trees is the Girl Series, all with girl’s names like ‘Jane’, ‘Ann’, or ‘Randy’. Bred at the US National Arboretum in the 1950s, they are among the hardiest of the deciduous magnolias, growing well in zone 5, and often blooming well in zone 4. Besides the Star Magnolia their other parent is Magnolia liliiflora, another Japanese species with rich pink and purple flowers. The addition of this species allowed the breeders, Francis DeVos and William Corsair, to bring strong pinks and purples to their trees, which are sometimes called the “Eight Little Girls”. What makes these trees more reliable bloomers is that they flower 2 – 4 weeks later than most others. This means that the buds begin to develop later, and escape any late frosts that can quickly kill earlier starters. If you live in colder parts of the country, put a Star Magnolia, or one of its offspring, on your wish-list, and plant one as soon as you can. You are guaranteed not to regret your choice, and you will relish its beauty every year, with deep pleasure. I have a star magnolia which is blooming right now (November 3). Is this plant confused or can this happen? We’ve already had a couple of temps in the high 20’s, but mostly day time temps in the 40’s and 50’s and night time temps in the 30’s, even a couple of 40’s. You are in good company. I have read reports that this year some flowering cherry trees in Japan are blooming, causing consternation there. We only understand the basics of flowering, in terms of accumulating hours of cold, and changing day-length. Some trees are well-known for flowering in fall and during mild spells in winter, but I personally have never seen this with a star magnolia. Big temperature fluctuations in fall, before the tree goes into full dormancy. could be the explanation, but I hope your tree holds enough unopened buds to still have a good display in spring. Hard to it nature into the boxes of our pre-conceptions, but I doubt that anything serious is wrong with your plant. Sometimes a few buds will just open, leaving most of them for the spring. If you have had a run of cold nights, and then some warm days, this can trick a plant into blooming early – and star magnolia doesn’t need much warmth to bloom, as it comes out in spring during pretty cold weather.